IDD is pleased to announce that the University has secured two Commonwealth Shared Scholarships for 2018/19 study. The scholarships are available to study two of the MSc programmes offered by IDD: MSc Environment, Development and Politics and MSc Conflict, State building and Development. One of the two scholarships is only available for these programmes and the other is available for other University programmes in addition to these two in IDD. Candidates must have an offer from the University to be considered for a scholarship. In order to apply for this scholarship, you must submit an application to both the University of Birmingham and the Commonwealth Scholarship Commission. You can complete the University’s application via our online Commonwealth Shared Scholarship application form once the competition opens on 23 February 2018. You may submit the application form before you have received an offer from the University, however you must have secured your offer before the deadline of 31 March 2018 in order to be considered for a scholarship. To submit your Commonwealth Scholarship Commission application, you must complete the Commission’s Electronic Application System (EAS). Guidance on completing this form can be found at http://cscuk.dfid.gov.uk/apply/shared-scholarships/info-candidates. 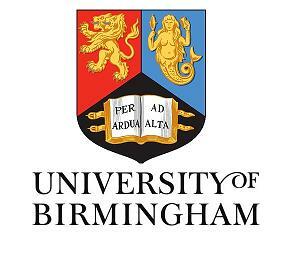 Award Providers: The award is financed jointly by the University and the DFID.